The age old tradition of a secret ingredient in salads called ‘Microgreens ‘is gaining quick popularity. It has become a chef's first choice of salad garnish these days. We have come to accept the baby fraction of a few of our vegetables like baby lettuce, baby spinach, etc. But now, a more juvenile stage (less than 14 days old) of vegetables like mustard cress, radish, basal, coriander, fennel and beet greens have been incorporated in soups, pastas and salads to make food more nutritious and tastier. According to a scientific study conducted on such greens by the U. S. Department of Agriculture and the University of Maryland, College Park, the results were outstanding. The researchers looked at levels of vitamin C, vitamin E, vitamin D and phytochemicals in 25 varieties of microgreens and the results showed that the levels had four to six times more nutrients as compared to the mature leaves. Since they do not take a lot of space, you have a good chance to develop your hobby of kitchen gardening by growing these microgreens in small trays. 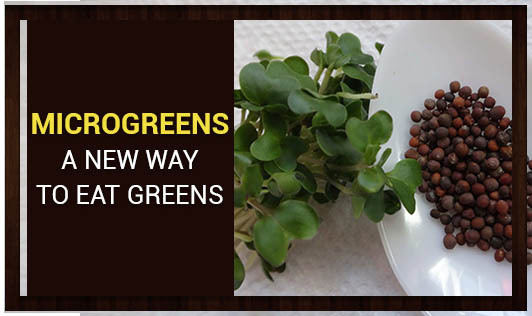 So, it's time to get started and include microgreens into your diet and make it more nutrient rich and tasty!